Behold the ultimate swimsuit fit for royalty! I cannot possibly do this episode justice in writing without regurgitating the events. But that would be redundant since I’m sure you guys all watched it for yourselves. Nevertheless, I will endeavor to mention some of the highlights briefly. First of all, those perverted old advisers in Petralka’s swimsuit council. Oh god those guys. 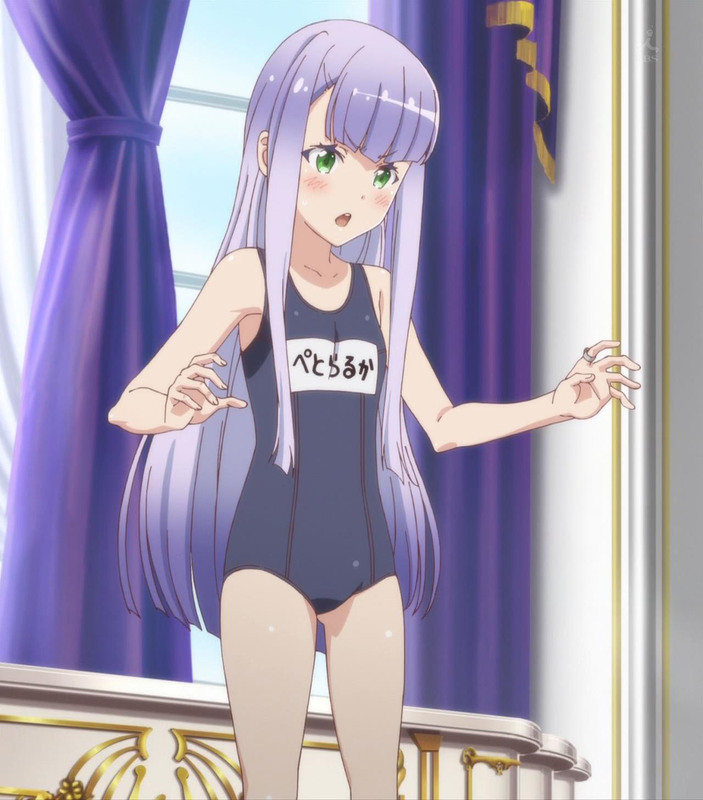 No matter how hard they try, the inevitable conclusion is that the only swimsuit suitable for her royal highness is the school swimsuit. And I have to say seeing the final result at the end, I can only agree. Next we have more Myucel and Shinichi being OTP. After some water splashing, the half elf attempts to replicate Petralka’s blushing “rice on cheek” stunt. Nice effort, but she blows it by putting the grain of rice on her forehead. Yeah, I don’t think any amount of messy eating can do that. But at least Minori was kind enough to play along with it. Speaking of Minori, she brings the fanservice here with her sizeable assets. I’m as curious as Shinichi as to why she hasn’t seen anyone before since she has a *ahem* nice figure, but I hazard it’s because her BL interests scare the guys away. And while we’re talking about fanservice, Myucel and Elvia contribute their own fair share, the former with unfortunately explosive consequences to the lucky pervert that Shinichi is. In retrospect, this is probably the most tasteful trashy fanservice episode I’ve ever seen in all anime. It almost doesn’t even feel like a guilty pleasure. But I digress. The final nail in the coffin is the minor subplot inserted in the form of three JSDF grunts performing “surveillance and protection” on the unwitting group. Hey, even the minor characters need to have some fun once in a while. Just don’t expect to come out of it alive once Minori finds out. As you say, Sum, this show just continues to delight. I really love these characters, and enjoy the fun they have. That is the best praise I can give this episode and the show in total. And kudos to that advisory dude. He just knows, man. 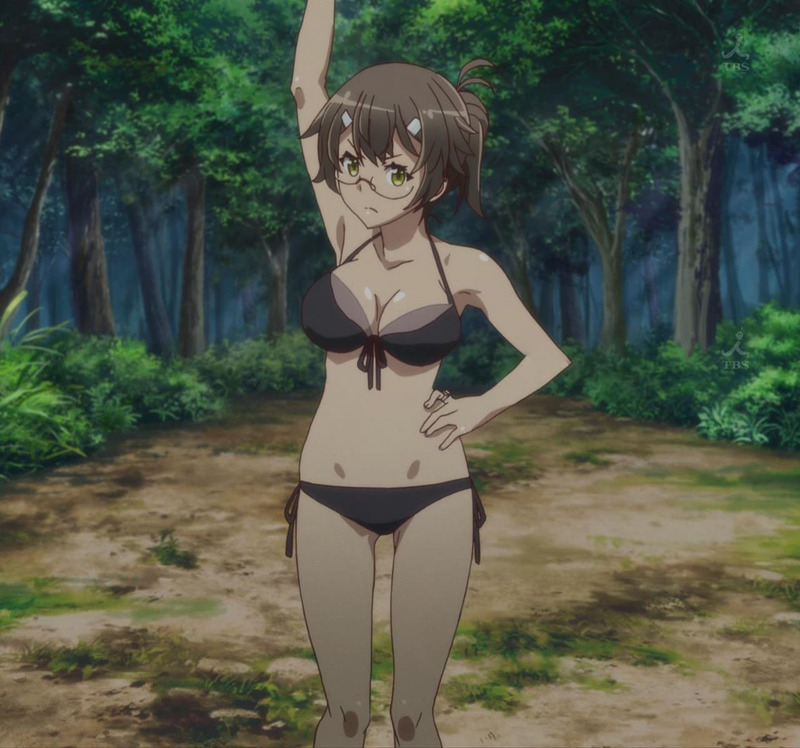 Boss points are over 9000 in the school swimsuit choice. Oh, BTW, can we call the elf boy and the LOLi dwarf a couple now? can we call the elf boy and the LOLi dwarf a couple now? I’ll give points to the guy who voted for the school swimsuit at the start for persistence. In the end, he won the gold. Never give up! I was so hoping they wouldn’t go for the school swimsuit, and keep rejecting it. I know this show plays fast and loose with the tropes (hah! at Minori and her “Want to go for another trope?” with the oil), but I think it would have been better to keep rejecting the school mizugi. Of course, I don’t like the look at all. While I really like Myucel, I think Petralka could use a little bit of evening up on the development. Her hikikomori episode just doesn’t seem to go as far as Myucel’s Japan episode did.